Charm oozes out of these round characters as they roll their way through progressively more complex puzzles to teach kids logic and science. It’s fabulous fun! Thinkrolls 2 follows in the footsteps of the award-winning Thinkrolls by creating a new set of puzzles that has a similar format and yet is refreshingly unique. Kids don’t need to have played Thinkrolls to enjoy Thinkrolls 2. Thinkrolls 2 presents its set of vertical maze puzzles as chapters, with numerous levels within each chapter. At the beginning of a chapter, kids meet a round animated character who wants to follow another character through the maze. 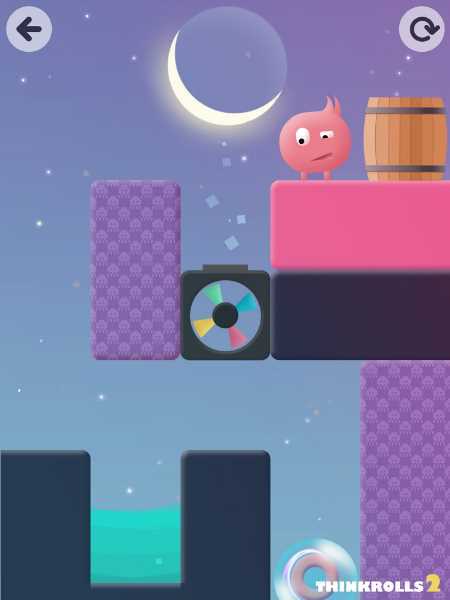 Every character can fold itself into a ball for rolling, and the rules of gravity apply as the ball characters drop through the puzzles from the top to the bottom. 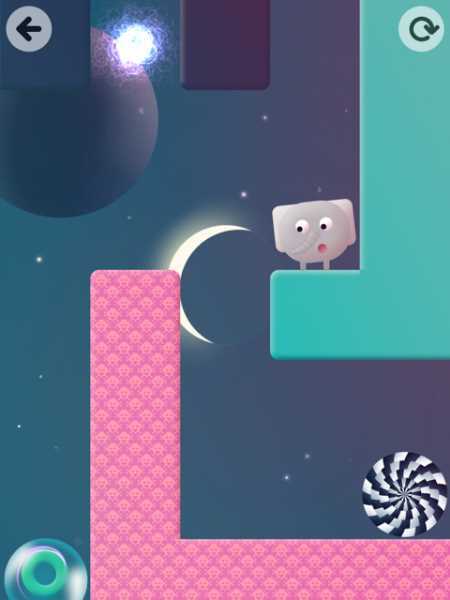 Kids help the chasing character by controlling its rolling and then moving blocking items and manipulating things in the environment to create pathways. 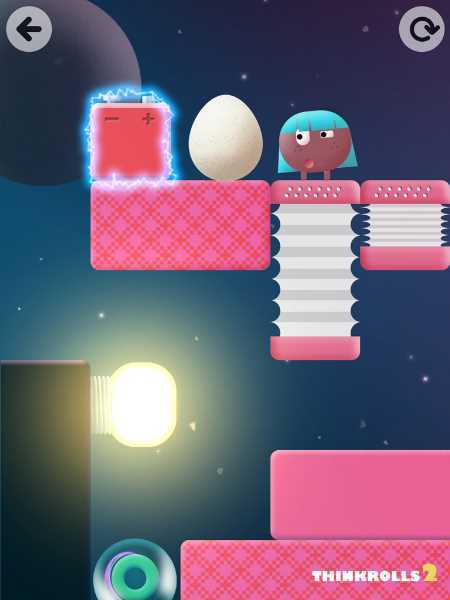 In each of the first seven chapters, the app introduces a new object to teach a concept relating to properties of matter, basic physics, or logic. Players will learn to expand and contract accordions to create ledges, steps, bridges, and to open blocked pathways. They throw wooden barrels into water hazards to create floating platforms for Thinkrolls to glide over. Other objects include eggs (how much force is needed to break one, and the type of surface it lands on matters), fans (for creating uplifting experiences! ), wormholes (adding a little sci-fi logic about when to teleport so that you end up in the correct location within the puzzle), batteries (which can be shocking if touched at the wrong time), and light bulbs (to provide memory training before the light goes out in a scene). The eighth chapter combines all of the previously learned concepts into new puzzles. 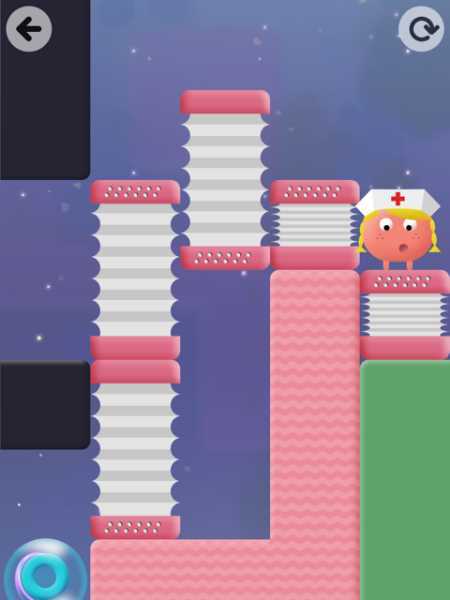 Thinkrolls 2 bounces to the top of our ratings chart because it masterfully combines silly fun with progressive learning. Avokiddo has crafted a superb piece of digital media by being thoughtful in how it put together this app. This is an app your kids will love to play! The rambunctious, emotive Thinkrolls are irresistible as they roll, giggle, speak gibberish, and wiggle with excitement. They are also hilarious with their expressions, from spinning spiral eyes when dropped off a cliff to wide smiles when you complete a level. Kids will get a kick out of their appearance, which run the gamut from animals to Little Red Riding Hood to a ninja. Avokiddo has done a great job of imbuing these characters with diversity. Kids see all different skins tones represented, as well as characters sporting glasses and different hairstyles. Thinkrolls 2 is an app that can grow with your child. It offers two levels of difficulty: easy for ages 4-5 and hard for ages 6-9. It also has a lot of content presented in 270 levels, with 135 found in the easy chapters and 135 in the hard. And each chapter features its own unique music, which adds to the funky vibe of the app. In this app, players learn by trial and error -- a method that puts them in control so that the learning becomes personal. And the experimentation within this app is exciting -- what happens when you send the egg rolling over the edge or into a wormhole? If your experiment goes wrong, the level resets so that you can try a different theory. In the middle of all this maze fun, Thinkrolls 2 introduces some science concepts, including gravity, buoyancy, electricity, density, acceleration, mass, and aerodynamics. It also challenges kids to remember where things are in the level where the light bulb turns off. And all of these puzzles require kids to think logically, to figure out what to move in a puzzle and in what order. Parents, you don’t need to be connected to the internet to play this game. And it is free of in-app purchases and troublesome social media links. Its ad for other apps by this developer is hidden behind a parental gate. Plus, by using the parent section, you can set up six separate profiles. We recommend that parents use some of those profiles to jump in and enjoy this roly-poly goodness with their kids! The game tracks each child and bookmarks where he or she left off; and it allows you to individualize play by setting the game at Easy or Hard. Thinkrolls 2 has wide appeal for all kids. Who doesn’t want to feed a fearsome ninja into a wormhole or send giggling balls floating into the air by turning on a fan? 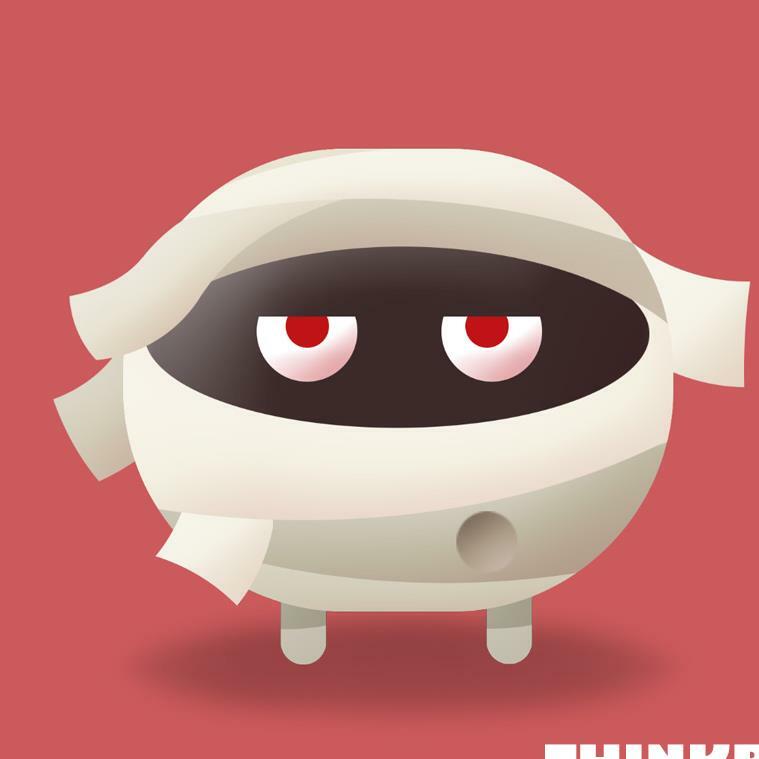 Thinkrolls 2 is riotous fun that shouldn’t be missed! 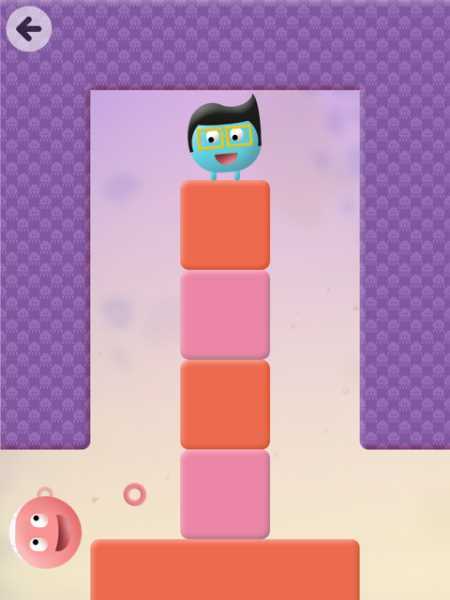 This Thinkrolls 2 kids app review was written by Jinny Gudmundsen. The original review was published on March 31, 2015 and it was updated to reflect the free addition of new content on April 15, 2016.